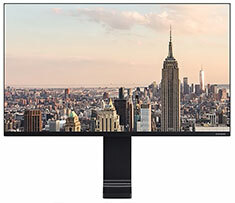 The Samsung R750 27in QHD 144Hz VA Gaming Monitor features a 27in screen size, WQHD 2560x1440 resolution, 144Hz refresh rate, 4ms GTG response time, 1x Mini DisplayPort, 1x HDMI, and more. Samsung Space Monitor’s zero-level HAS (Height Adjustable Stand) allows easy positioning of the screen for optimum comfort and convenience. Its adjustment span allows viewing from a height of 8.4 inches (213 mm) above the desk top (27-inch screen) all the way down to surface level. With up to 1.7 times the number of pixels of Full HD, WQHD not only delivers detailed, pin-sharp images — it also creates a wide workspace, designed to let you see more of documents and webpages onscreen.